At Columbus Air Force Base (CAFB) in Columbus, Mississippi, a groundwater injection of carbon and the anaerobic microbial consortium SDC-9(tm) was determined to be the corrective action to increase the natural degradation of contaminates. Working along the runway posed special challenges. The first challenge was to create and store enough anaerobic injection mixture for a 442 point Direct Push Technology injection, and the second was to reduce the height of equipment staged near the edge of a runway. To address these challenges, large water pillows were determined to be the most viable solution. We used the 4-6000 gal potable water pillows to create large quantities of anaerobic water for an in situ bioremediation injection. The tanks provided a lack of a water/air interface which is present on most solid wall tanks. The lack of air aided in creating the anaerobic water for the injection. The water tanks also provided low clearance which was required on this project because the work was performed along runways. 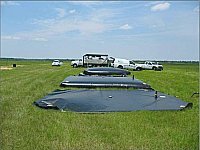 The 6000 gallon portable water pillows provided a mobile tank that was low in height, and a great way to produce anaerobic water with the addition of a carbon source and bacteria. The use of 6000 gallon collapsible water tanks eliminated the air to water interface found using rigid tanks, and enabled microbial populations to create an anaerobic system more efficiently. Approximately 12,000 gallons of anaerobic water were produced every twenty-four hours. Due to faster production of anaerobic water, the time required to be in the field was reduced from 40 to 28 days. The shorter field duration reduced project costs and potential impacts to flight operations. Portable Tanks, a division of GEI Works's customer service and sales team were very helpful on providing us with precise information on quality and specs of the water tank to aid us in our decisions making for the groundwater injection phase of the project. We had a leak along one of the corner seams and they quickly sent out a patch kit so we did not have to stop our injection. We have used the 6000 gal water pillow tanks and have been very satisfied. The Water pillows have now been used at 7 sites, and one of the sites is doing multiple injection and have ordered 2 more water pillows. View our Pillow Tank page for more production information.